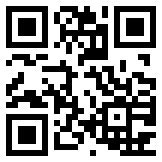 The above picture is a QR Code or a two-dimensional bar code. The "QR" is derived from "Quick Response", as the creator intended the code to allow its contents to be decoded at high speed. These types of code, which were initially used in manufacturing, are now used in a much broader context. QR Codes storing addresses and URLs may appear in magazines, on signs, buses, business cards or just about any object that users might need information about.